A contemporary style floor lamp with an eye-catching white flower form. Add a dramatic splash to any room with this stunning, contemporary floor lamp. The simple base features a lustrous and sophisticated brushed steel finish. This piece is defined by the acrylic "flower" shade. Layers of "leaves" stretch upwards giving this floor lamp a one-of-a-kind appearance. Add a touch of modern design to your decor. Overall: 63" high. Base is 9" wide. Shade is 20" wide x 12" high. Weighs 17 lbs. Takes one 60 watt A19 medium base bulb (not included); on-off foot switch for easy lighting control. Flower-style modern floor lamp from Possini Euro Design®. White acrylic petals top shade with an acrylic bottom diffuser. Brushed steel finish base and pole. modern fun and reminds me of Spring. Perfect fit for teen granddaughter's new bedroom makeover. She'll love it. Comparibly more reasonable price and contemporary design. 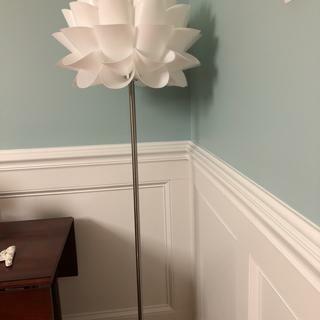 I wish the other floor lamp design of the same flower style had a better price, too. A beautiful floor lamp for my granddaughters room. She is going to love it. I love the same style I own in the ceiling lamp. I love the flower design. HAVE A CIELING LIGHT IN THE SAME PATTERN, LOVE IT. I wanted something different & this looks so pretty. I hope I won't be disappointed . It's beautiful & I love flowers! Its beautiful and will brighten up my bedroom. How to get rid of excess chord? The instructions do not explain or show how this should be completed. Wish I could help you, but I really don’t have an answer. I gathered mine up and put a rubber band around it. That is certainly not a good remedy, but it serves my purpose. I am sorry I don’t have a better answer. Hope you find a way to make it work for you. Enjoy your new lamp. I love mine. There isn't a built in retraction feature, so you will need to simply tie it up. It is a great light - tons of compliments on it! BEST ANSWER: Hi - this features an on/off foot switch. But it can be dimmable by adding a foot dimmer. 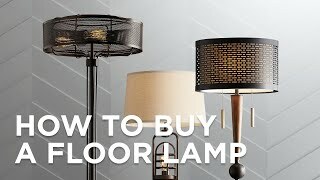 Can I do that with most of these floor lamps? I purchased this lamp and love it. It's not made as a dimmable lamp, but you can plug it into a dimmer, and use a dimmable light bulb, to make it dimmable. I have a few dimmers around the house. You plug the dimmer into the wall, and then plug your light into the dimmer switch. Actually do the same thing with my Christmas tree. I see several posts that say is difficult to clean, what has been the recommended best way? BEST ANSWER: To clean the flower you can use a damped cloth and wipe it down. Need to clean petals so lamp, how do you take flower part off pole, I tried unscrewing light bulb?? BEST ANSWER: Hi - this design uses one maximum 60 watt standard-medium base A19 bulb. 40w by choice.....wanted soft light. 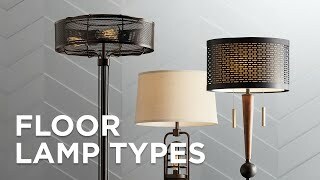 BEST ANSWER: This floor lamp is not UL or ETL listed. What is the weight of this lamp? Is the single thin pole flimsy? BEST ANSWER: Hi! No, the pole is not flimsy. 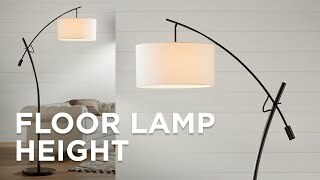 This floor lamp weighs 17 lbs. Hope this helps! BEST ANSWER: This lamp has an on-off switch on the cord. However, if you would like the fixture to be dimmable, you could use a floor dimmer or remote dimmer to control the light. Click on the images below for more details. Does the lamp illuminate a whole room or is it pretty dim? I can't get a good sense based off the picture. BEST ANSWER: It depends on the size of the room but it's enough light to read by. It also really beautiful and everyone that sees it comments on it! I would definitely buy it again! The lamp lights my entire room. I have an open floor plan & it is the only light I use at night. Only exception is if vI'm cooking in the kitchen. Depending on the wattage bulb you use the light can easily illuminate an entire room. I have a 60 watt in, and it’s very bright! This lamp lights the whole room and looks beautiful. What is hieght to bottom of flower? BEST ANSWER: Hi - from the floor to the bottom of the flower shade is 51". do i have to assemble the petals?? BEST ANSWER: No, but you will need to assemble the lamp, which is simple. We love it! No, it comes pre-assembled. it's a great lamp for the price! What type and wattage bulb can be used? BEST ANSWER: Hi - this design uses one maximum 60 watt A19 medium base bulb. I think it was a 60, however, I am not certain about this. I do remember that I bought the bulbs from LAMPS PLUS because they gave me a good price on them. Had previously purchased the table version of this lamp and was looking for something to brighten up a dark corner in the living room. The only downside really is cleaning the shade. Loved this lamp first time I saw it ! Absolutely beautiful ! A real statement piece. Everyone who has seen it loves it. I bought matching ceiling lamp. Looks great over dining table. I have a open floor plan & they really compliment each other. Beautiful lamp. Nice heavy base so it doesn't tip easily. It is beautiful and looks great in the dining room with the matching chandelier. Stunning compliment to the dining room. I knew immediately, when I saw this lamp online, that this was the 1 for my granddaughter's bedroom. It was shipped across country and arrived securely wrapped. Putting it together was very easy. Very well made, solid & weighted on the bottom. The plastic pedals for the shade are secure and strong. The shade is as pictured. The foot pedal switch is nice to have. 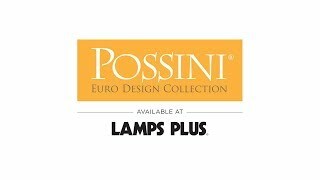 Definitely would buy Possini Lamps in the future. 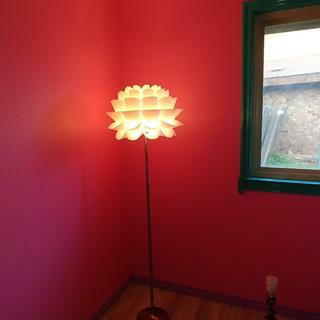 I purchased the lamp for my granddaughter's new bedroom which looks fantastic. I love this lamp , put a orange bulb in it and it looks very elegant. My husband has commented several times on how beautiful it is . Great focal point. I like this item and the price is right. With a stylish Guinea patterned shadethis slim-profile floor lamp design offers a chic look for seating areas and more.